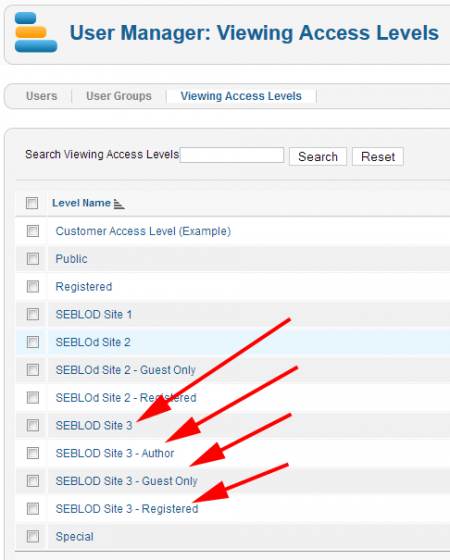 SEBLOD multi-sites feature is based only on Joomla 2.x or 3.x and SEBLOD 2.0, without any hack. This multi-sites solution use only one Joomla, and one Joomla database without any table duplication. One Master administration which allow the Mega User to manage all extensions and contents for all websites. All domain or sub-domain names must be redirected to the root of Joomla (same for all sites). 1) Log you in Super Administrator to administration. 2) Create a Joomla category, in this example called "Site1"
It's only a advise. You can always manage many contents for many sites in one category, but can be quickly complex to manage. 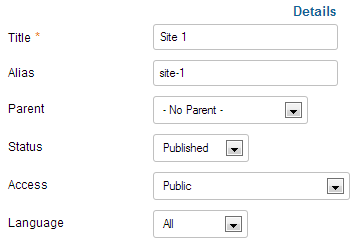 3) Create a Joomla link menu to define the home page of the site. In this example, we created “Featured Article” menu link called “Home” and we put in the alias “home-1”. The “-1“ is to differentiate all site home pages (and Joomla don't allow to have the same alias). Title: write a text. The title is used for the title of your site and displayed in Title HTML tag. 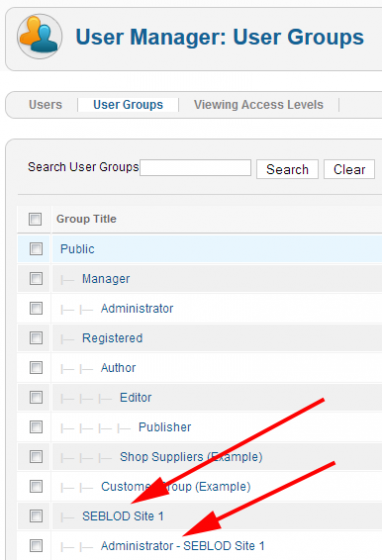 It's used to create user groups and access levels too (read Site types). URL: fill it with the URL of the site. This URL can be a domain name or a sub-domain. Must redirect to the root of Joomla site. Site Name: write a text. Used as the primary key of the website. Include Site Name: select an option to include or not the site title in the (meta) Title of each page, after or before the page name. Meta Description: write a text to describe the site. Used for the Description META tag. Meta Keywords: write some words separated by a comma. Used for to define Keyword META tag of the site. Homepage: select a Joomla menu link to define the homepage of the site. (create it before or assign it after site creation). Language: if the site is to dedicated to a language, select the language. If you use this mode, you don't need to use the Joomla language field, just assign contents to the site by using access levels. SEBLOD will assign automatically the good language to your contents. Template Style: select a template style and enjoy to present like you want this site. 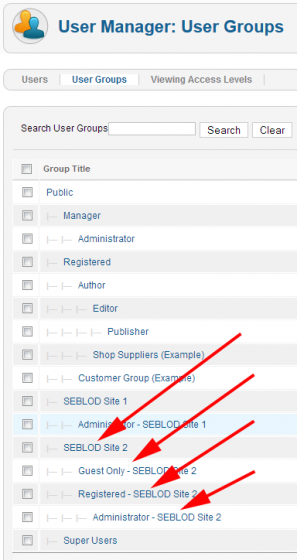 SEBLOD created some user groups, access levels and example users related to the created site to simplify the task. Check your emails. SEBLOD send to the Mega user some emails for each user created, and all information related to this user like login and password. 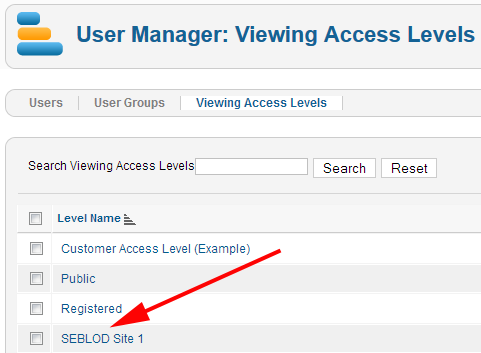 Verify user groups and access levels created by SEBLOD. Try to assign an article to the user group of the site and to display it on the homepage. Log you with each user information send by email after site creation and verify what they can do and see. In order to complete the setup of the site you should create a redirection of the main url (domain or sub-domain) to the root of your current Jooomla website, thanks to the configuration panel of your server/hosting. To display a content on a site, just assign this content to the "Public" access level of the site. To administrate the site, just log in to the administration with the administrator user (created by SEBLOD) of the site. To administrate all sites, just log in to the main administration of the site with your old super user which is now the MEGA User. Which contents do you can manage in multi-sites mode? ANY JOOMLA EXTENSIONS WHICH MANAGE JOOMLA ACL (Permissions) ARE NATIVELY COMPATIBLE WITH SEBLOD MULTI-SITES. Joomla 1.7 is not ended about the ACL in admin side. That's mean, you can not for example hide a module for a user logged in administration. But you can always not authorize the access to the Module Manager Component. You can manage items from: Joomla Articles, Joomla Categories, Joomla Link Menu. So, an administrator of a site will see only the menu links of his site, the articles of his site, the categories of his site. When a site is created, different types of site can be selected: Basic, Standard and Advanced. This document presents this different site types and how to choose the best one. 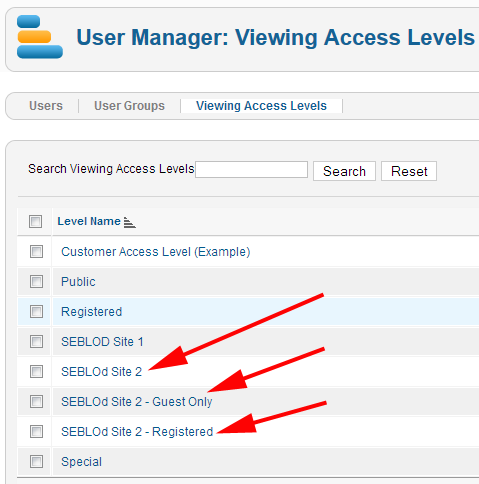 After a site creation, SEBLOD create for you some user groups, access levels and example of users. All this is to simplify the start because Joomla ACL are not so easy to manage. All users which visit the site are automatically assigned to this Public group. Assign a user to this Administrator group and this user will be the administrator of this site. The user access to his administration via my_site_domain.com/administrator . Assign any content (modules, categories, articles) to this Public access level and this content will be displayed only on this basic website. Assign a user to this Registered group, and this user will be able to log in on the front-end like classic Joomla registered user. Assign a user to this Administrator group and this user will be the administrator of this site. The user access to his administration via my_site_domain.com/administrator . Assign a content to the Public access level and this content will be public and displayed only on this site. Assign a content to the Public Only access level and this content will be only public and only displayed for public users of this site. Assign a content to the Regsitered access level and this content will be restricted for registered users and only displayed if the user is logged.